According to experts, 2016 will be the year of the beacon. With the unlimited opportunities that beacons offer to both retail and non retail verticals, businesses all across are gearing up to effectively leverage iBeacon technology. One of the most vital requirements for this is having a beacon app. It is essential to have a good beacon-enabled app, which is not solely designed to push promotional offers to customers but should also convey the value offered in return for the personal data that is asked for and make your customers’ interaction with your brand ‘flexible, convenient, and relevant’. Asking for permission to access bluetooth and location services are the two bare essentials for your beacon-enabled app to interact with beacons. You can achieve these essentials by using a geofence to push a notification as a subtle reminder for users to turn on their bluetooth and location services. If you are launching a new app, it’s best to ask for these permissions as late as possible to let users see what your app offers. You can eventually ask for permissions when a user is close to a beacon. 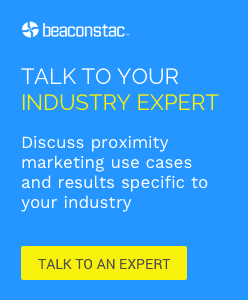 What are the 5 important tips for building your beacon app? When the app is near a specific beacon, it pulls that beacon’s information such as UUID, major and minor numbers from the data on the server. It also queries the ‘business logic script’, to get a list of all users that are near that beacon. The script then filters this data for privacy and interprets if a user is really “at the beacon”. This is a tricky task, considering a lot of times update events do not make it to the server, or an iOS device can drop beacon ranging. Beaconstac’s business logic, for example, uses a time-based heuristic to guess if the user is reasonably still there. For example, if the user was last recorded at the specified beacon within a short (5 minute) window and didn’t move to a different beacon, the user is counted as actively at the beacon. How to build a successful beacon app? Do you have any tips or suggestions from your own experience of building a beacon-enabled app? Let us know in the comments below.